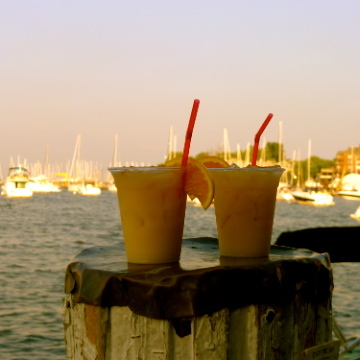 Looking for something new to do in Paris? 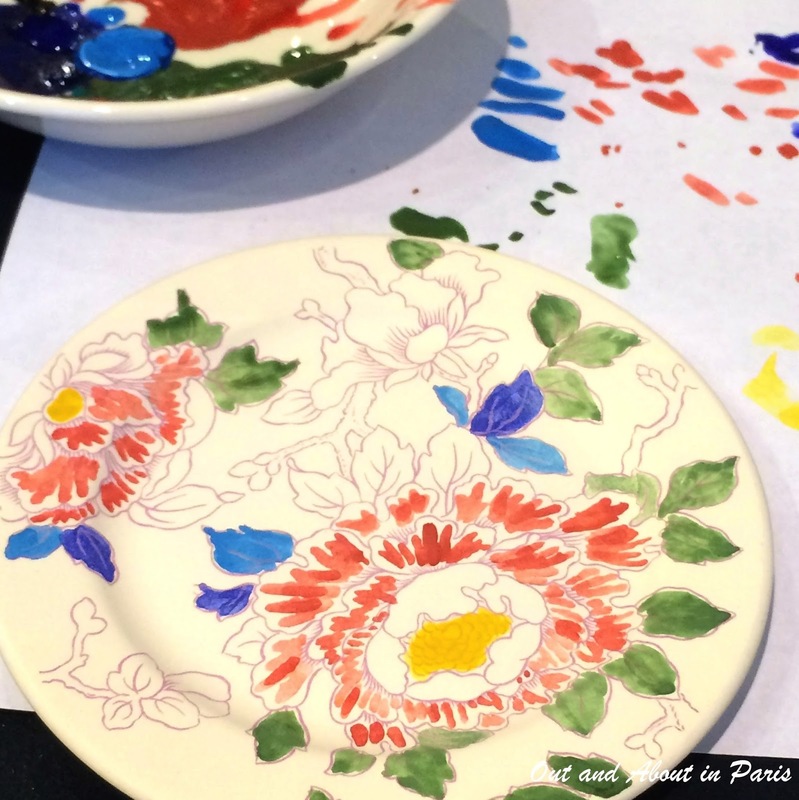 Try a Gien faience painting workshop! Living in France has taught me to be flexible. If it rains on the day that we've scheduled a picnic with friends by the Seine, we'll change gear and spread blankets on the floor of our living room. If metro line 10 isn't running because security guards have found a suspicious package, I'll check the RATP application for alternative routes to my destination. I've learned that the need to be adaptable is an integral part of life in a dynamic city like Paris. Perhaps that's why my morning coffee has become such a ritual. I have to drink it out of one of the Gien faience cups given to me by Mercedes or my day feels completely wrong. If all the cups are in the dishwasher, I invariably open the cupboard and gaze despondently at the assortment of other coffee cups before washing one of my favorites. There's something about the delicate weight of it in my hand that makes drinking coffee an even more pleasurable experience. This obsession with my Oiseau Bleu coffee cups explains why I was so excited when Solène Colas of A Journey in Paris asked me to join a ceramic painting workshop at the Gien flagship showroom near La Madeleine. It was only after I had accepted her invitation that I started to feel the first pricks of doubt. I'm not at all crafty. Would I be able to paint anything that didn't resemble a child's art project on the first day of school? In a desperate search for inspiration, I reviewed photos from Stéphane's and my visit to the Gien museum during one of our trips to the Loire Valley last summer. I even began stalking Solène's Instagram account to see what other people had painted. Elodie Berta snapped this photo while I was diligently trying to paint within the lines! It was only after Solène welcomed our class at the Gien showroom that I started to relax. There, on the table next to the paint brushes, were plates stamped with a peony design dating from the 19th century. My fears were completely assuaged when Solène explained that we only had to decide if we wanted to use the traditional multicolor theme, blue variation or our own variation. We didn't have to come up with a completely new pattern! 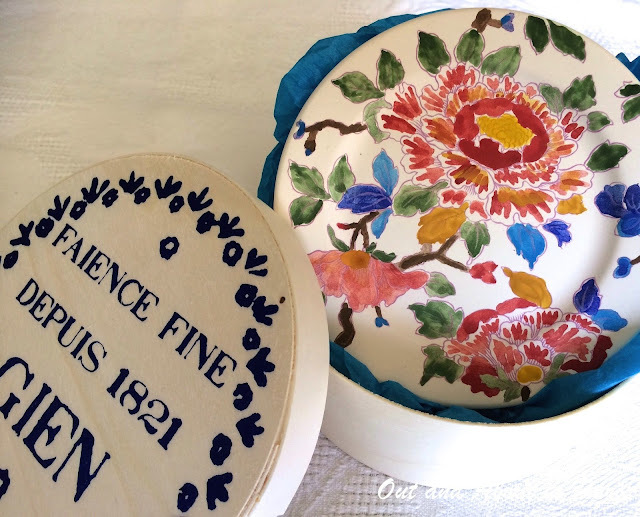 As the peony is one of Gien's oldest designs, I opted for the traditional colors: light red, yellow, Delft red, green, light blue, dark blue and brown. A masterpiece in progress! 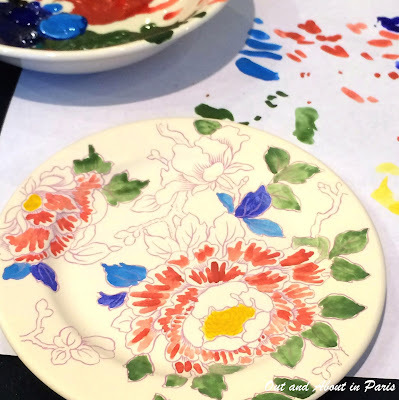 Gien ceramic painting workshop in Paris. 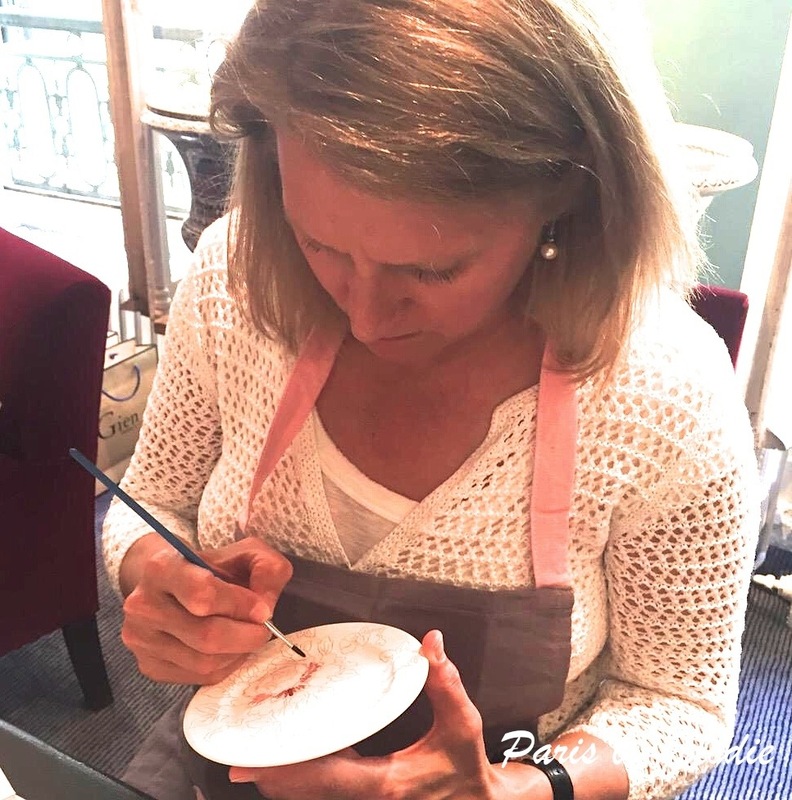 While we mixed our gouache paints, Solène shared some of the secrets that she has learned from the professional painters at the Gien factory. As you may have noted in the photo taken of me by Elodie, Solène's advice to work with a light hand went somewhat unheeded. It seems that I had a death grip on my brush! I did, however, strive to test the colors on a sheet of paper after mixing them rather then applying them directly to my plate. 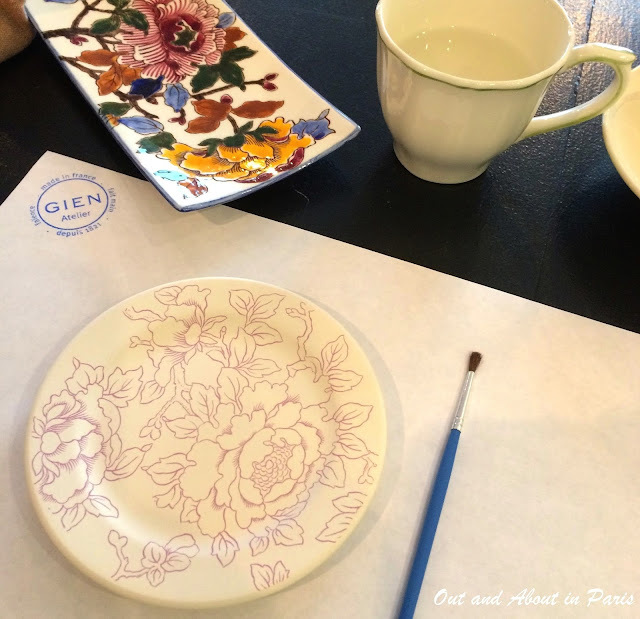 By the time that the two hour workshop drew to a close, I had developed an even greater appreciation for my Gien coffee cups and saucers. Not only are they a testament to French elegance, they're also a tangible reminder of the craftsmanship that went into each piece. Even though it would take years of training for me to match the proficiency of the painters at Gien, I'm very pleased with the end result! If you're looking for a unique experience in Paris, please visit Solène's website for additional details. The two hour class, which is 90 euros per person, is for groups of two to eight. The plate, paints and tea or mineral water are included in the price. The class is held in the studio of the Gien flagship showroom, 18 rue de l'arcade, 75008 Paris. Et, voilà! Here's the end result. If I wouldn't have had to rush off, I would have probably filled in a bit more of the white. Nonetheless, I'm very pleased with my plate! So cool! I have been collecting the Fables of Fontaine set, it's adorable. I didn't know there was a museum, maybe I'll have to fit it in on my next Loire trip! How fun! That is truly an original thing to do in Paris…..
Well done. Love my pieces of Gien. And the paper napkins too! You did a beautiful job with the plate. What a memorable experience! This is a wonderful idea, thanks so much for posting about it! I completely understand your dedication to your Gien coffee cups--I have my favorites too. So, did you paint a cup saucer or a small plate? YES....going to do this to make my own special birthday present in Sept! !